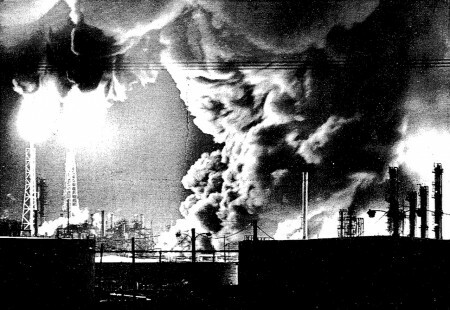 On May 5, 1988, one of United States’ worst oil refinery explosions occurred in Norco, Louisiana. There were six employees that were killed and 42 local residents injured. The blast was said to have reached up to 3o miles away shattering windows, lifting roofs and sending a black fog over the entire town of Norco. Residents were forced to evacuate while officials died the fires down and gathered as much rubble as possible to recover any bodies. In order to discover the root cause of this disaster, the Federal Occupational Health and Safety Administration as well as the Environment Protection Agency came and investigated the scene to gather information. The only possible root cause they could find was the catalytic cracking unit, machine used to break down crude oil into gasoline, because it was at the center of the explosion, but there was no definite cause found. Overall, the amount of damage done cost Shell millions of dollars and set an incredible amount of fear into the residents. Read here for the full story and direct quotes in the New York Times.